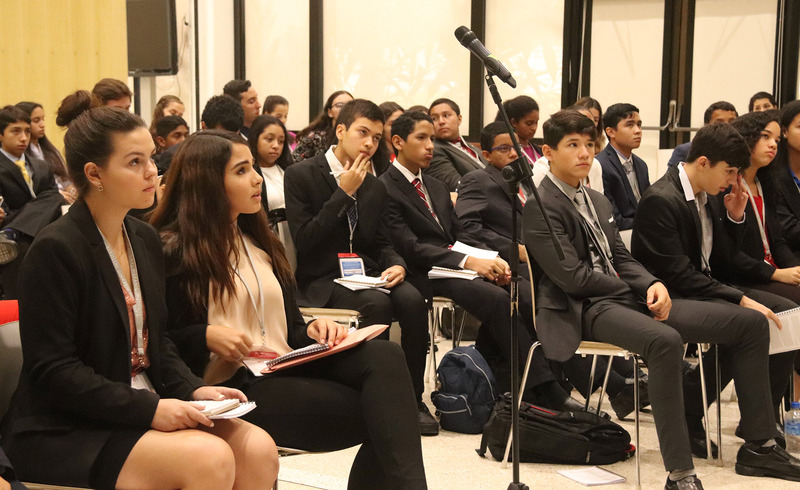 The 2018 LDZ Las Americas program, the first-ever NHI program to have two host institutions involved, served as a leadership launchpad for 80 students, most from Panamá, at Cuidad del Saber, which has established itself as the longstanding home for LDZ Las Americas. Florida State University-Panama also served as a host institution for its first year ever, supporting NHI’s efforts in running the program. Regina Romero-Garza, from John Paul II HS in Dallas, Texas, and one of the few Americans who traveled to Panama for the event, was elected President. Maria Alejandra Dominguez, from Colegio Brader in Panamá’s capital city, was elected President of the Senate. Her classmate Doménico Iovane served as Chief Justice for the session. José Vidal, who attended’s El Colegio de Panamá in the capital but from hails from Caracas, Venezuela, was elected President of the House of Representatives. “Create institutions where people share knowledge for further competitions or projects,” by Eduardo Spiegel.